Take your pick from three pretty pastel shades that will brighten up your Autumn look when you wear this Jacquard Crew-neck Sweater. We love it in pink for a feminine vibe that goes with jeggings, jeans or trousers. 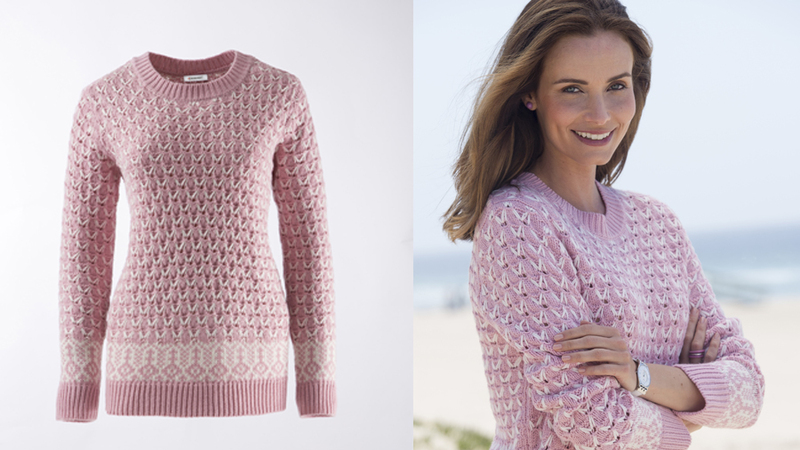 The perfect knitwear piece – its quality wool mix gives you the cosy warmth you want but in an easy-care item you can wash and wear over and over! The knit you need to see you from Autumn into Winter is our gorgeous Snowflake Sequin Sweater. It’s made in soft, easy-care fabric that sparkles with an embroidered sequin snowflake design, making it ideal for a dressy yet casual, everyday style. It’s easy to see why it’s a popular bestselling style for this time of year! Plus with a turtleneck, it keeps the chills out and keeps you cosy. Get yours in pale blue or pick from three other feminine shades. For cold weather comfort get our classic Cable Detail Jumper with wool mix to keep you cosy. This new style V neck cable jumper gives you a relaxed modern look and is just perfect for layering over a collared blouse. Wear for lunch with friends or Autumnal weekend walks – it’s sure to become your go-to casual knit. Choose from two colours – our favourite is the pink petal hue. 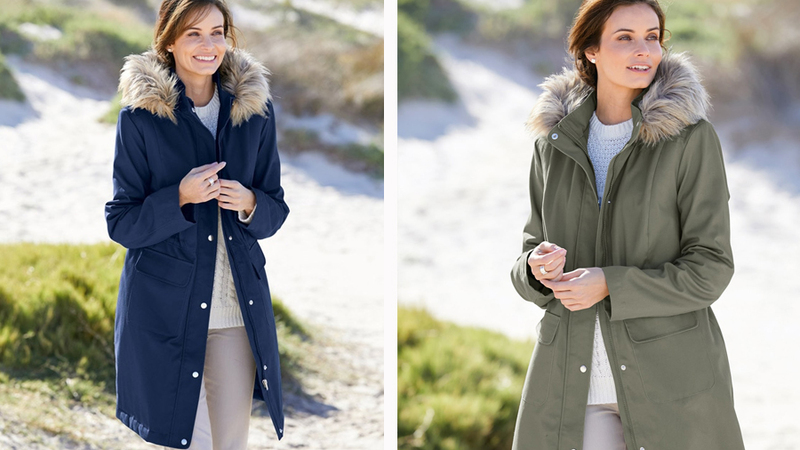 When it comes to coats, look no further than this ultra stylish, ultra comfy Parka! 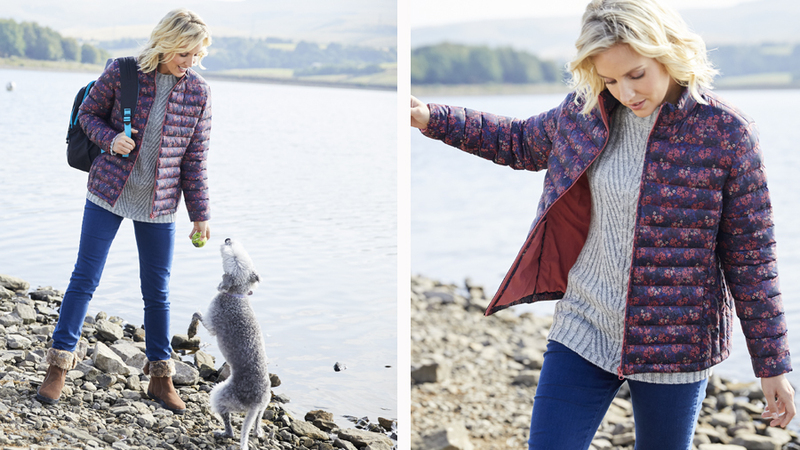 An absolute Autumn essential with soft padding to keep you cosy, showerproof fabric to keep you dry and a handy detachable hood for those unpredictable seasonal showers. All of this from only £39.99 and it comes in a choice of three colours including a gorgeous bright fuchsia! Ready whenever you need it, this Thermolactyl Padded Coat packs away into its own bag so you can carry it with you just in case! And while it may look lightweight, you can trust its soft padding and clever thermolactyl material to keep the chills out and the warmth in. This essential quality layer starts at just £59 – for a bright pop of colour, pick our floral burgundy print option. Designed for lightweight warmth is our modern Cotton Parka with fashionable faux fur hood. Parka coats like this one never go out of style so you can wear them season after season! With a flattering long length, lining and double-fasten zip and press-stud, it’s ideal for cooler Autumn days. Get this contemporary casual look in khaki or navy from £79. Essential for the season are fleece jackets – so versatile whether worn alone or as an extra layer under a coat – they’re the wardrobe staple you need when the temperatures are up one day and down the next. And the best thing is our stylish fleeces start at only £29! Our best-selling Button-through Sherpa Fleece is a great alternative to a coat. Its super cosy textured fleece feels soft and comfortable to wear plus it’s fully lined for extra warmth. It’s available in 5 colours but we love this gorgeous navy one! Comfort meets warmth with this soft Fleece that features cardigan-style ribbed sleeves and handy pockets. A practical alternative to a jacket, it boasts floral embroidery that adds a pretty feminine touch. You can team it with jeans, trousers or skirts for a stylish casual look. Another stylish addition to your casual Autumn wardrobe is our hooded Fleece Cardigan with a relaxed fit. So whether you’re relaxing round the home, gardening, getting some exercise or going on a shopping trip, it will quickly become your go-to layer for comfort. For added snugness, it’s even lined in plush faux fur making it extra cosy and it’s available in three colours. Accessorise this Autumn with our extra cosy essentials to complete your stylish seasonal look. Our wool blend Pom-pom Hat is a practical on-trend style for the colder weather and at only £15 is a must-have item. In two classic colourways, our traditional Check Scarf is the ultimate finishing touch to any Autumn outfit. Soft, cosy and warm, this versatile accessory will see you right through the Winter too! Finally, our wool-rich Faux-fur Trim Gloves will protect your hands from the cold and add a touch of glamour at the same time. Shop Damart’s essential Autumn layers today!